As the name suggests, this vibrant gown was inspired by the original ‘it’ girl: Clara Bow. 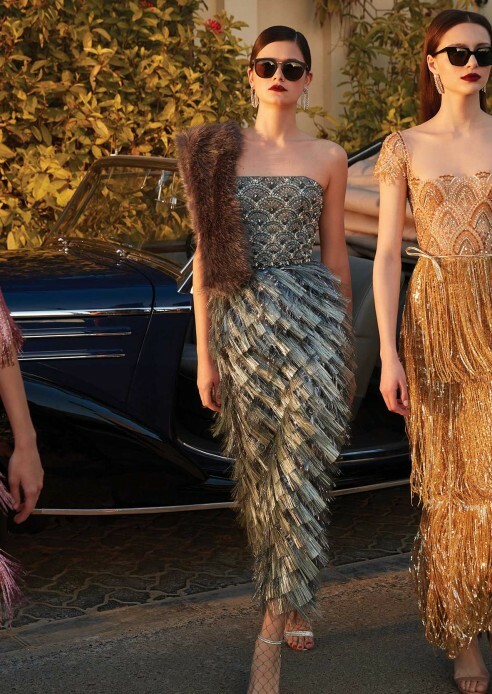 Renowned for her vivacious flapper persona, we recreated her signature allure with a modern silhouette. Thousands of delicately beaded pink tassels are handcrafted and sewn in staggered layers on top of a pink metallic lamé skirt. Using the finest illusion tulle, the top is made up of several intricate cascading designs creating the effect of floating jewelry. 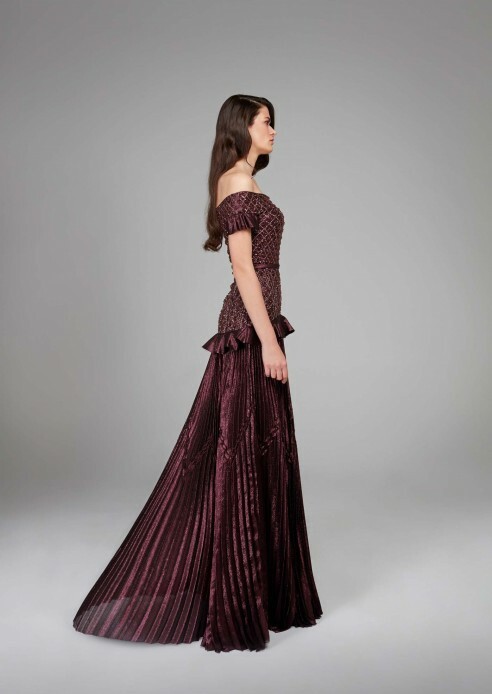 A combination of deep plum diamond-shaped glass beads are used with flat plum sequins to create a diamond pattern throughout the entire bodice of the gown. 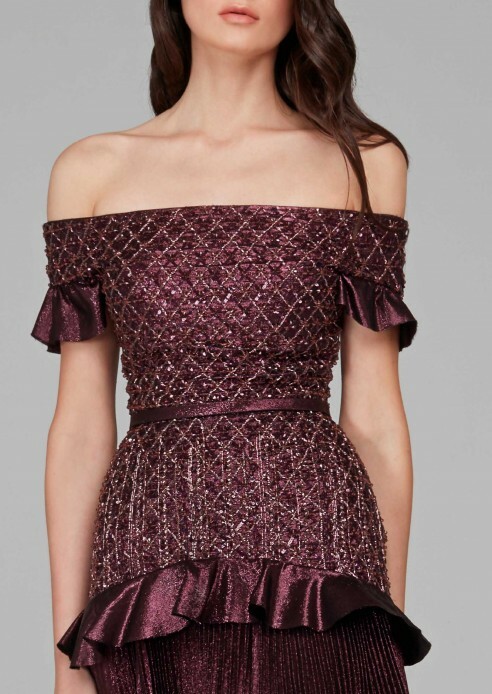 Using a luxurious plum lamé, the off-shoulder silhouette is fitted in the bodice and falls into a dropped waistline that reveals a plissé lamé skirt. Ruffle details are used in the off-shoulder sleeve and the dropped waistline as accents. ‘Monroe’, inspired by the one and only Marilyn, is a modern interpretation of the iconic bombshell silhouette. 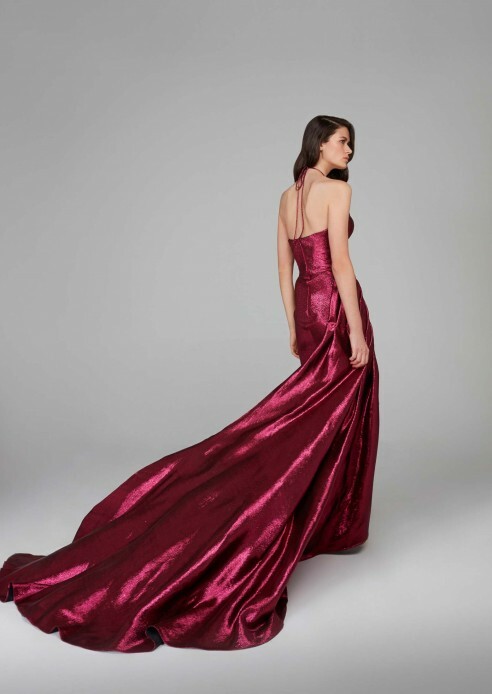 Gathered and pleated across the body from the bust to the ground, this dazzling fuchsia lamé gown reveals a sensual and flattering allure. Marilyn’s signature halter neckline is reinvented and modernized into a more demure cross-halter neckline. 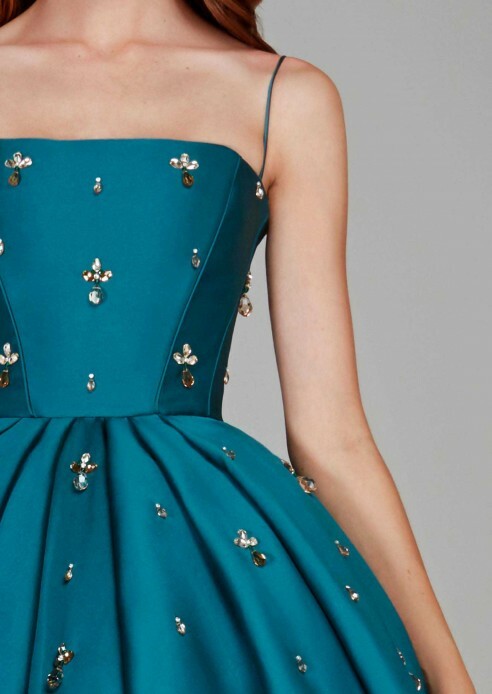 An opulent double sided taffeta is used to construct this fitted and sophisticated silhouette. 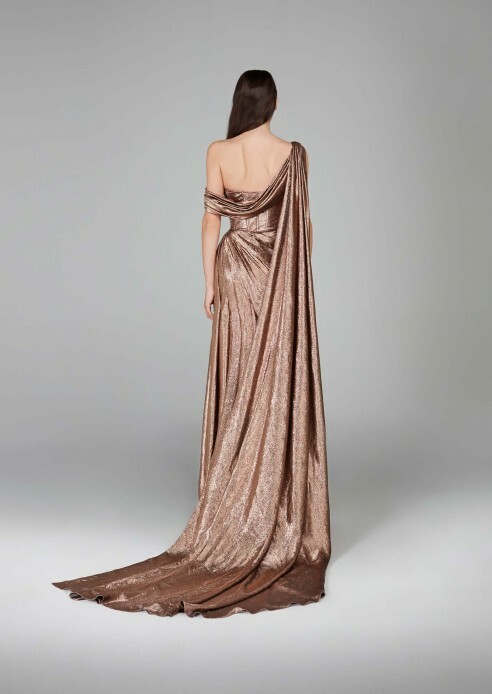 Reminiscent of the classic and prim 5th Avenue woman, this gown sits off the shoulder with clean drapes and a glamorous sweetheart neckline. 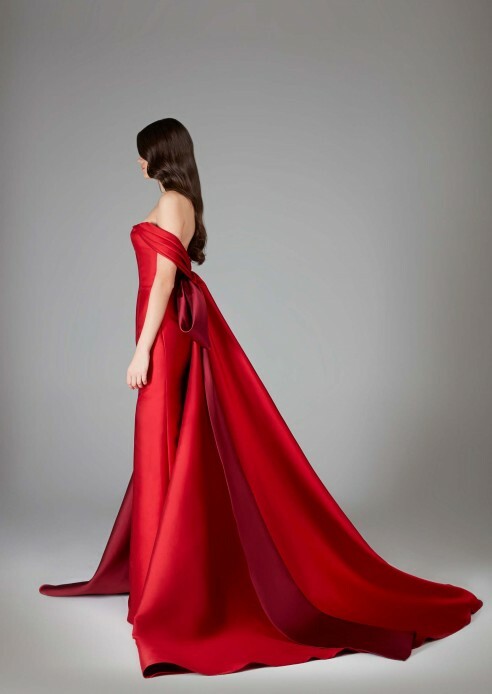 Turning up the volume, the drapes wrap around the arms and fall to the back creating a statement bow that cascades to the ground leaving a dramatic trail behind you as you walk. 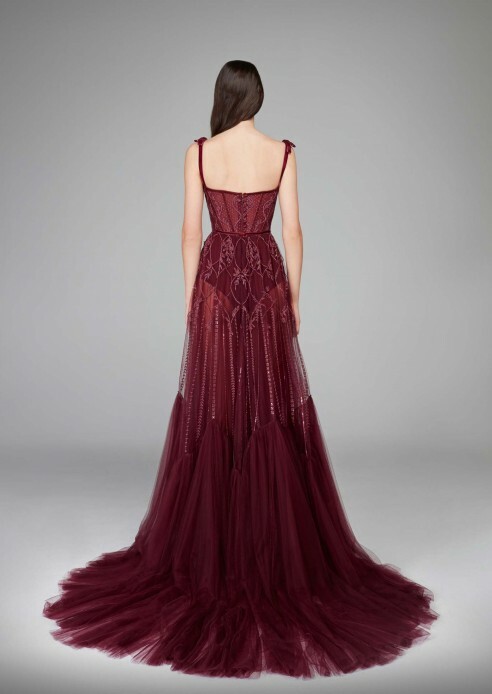 A rare combination of red and bordeaux, this gown is sure to make a statement. baring the mid-riff. 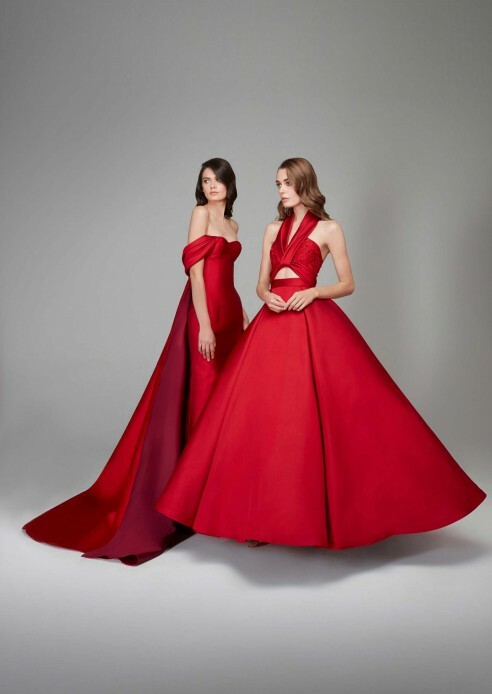 In this bold and luxurious red number, you are sure to make a statement. 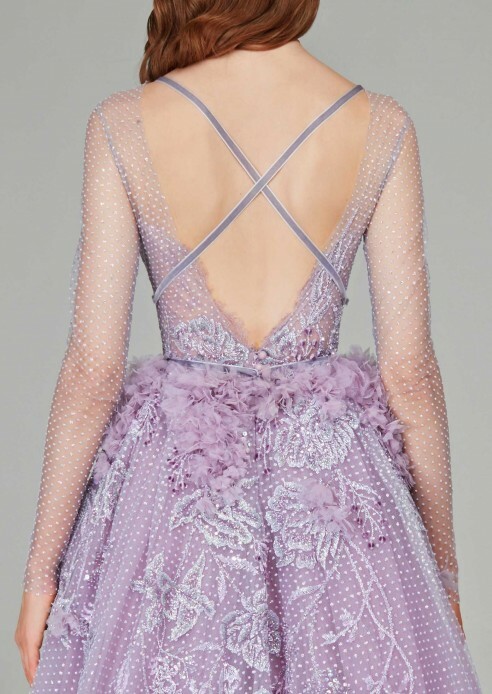 Made from layers upon layers of fine purple tulle, this stunning gown is defined by a corseted bodice that cinches in the waistline and an ever-flowing hemline that gathers into an ethereal train. 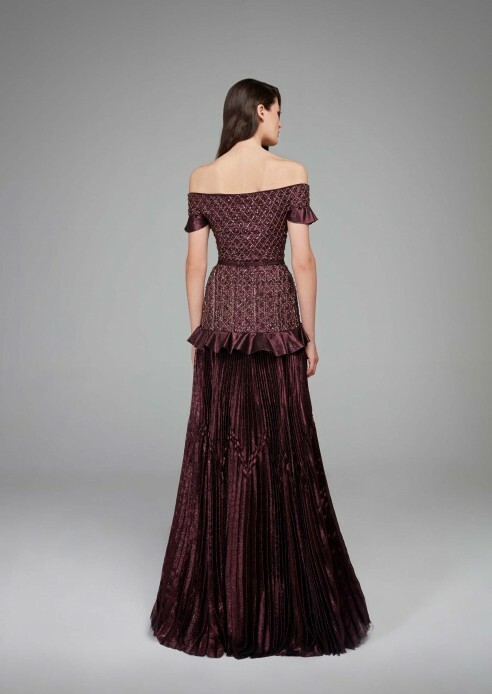 The intricate floral appliqués are combined with strips of deep purple velvet ribbon in the corset, creating panels that allow for a very flattering silhouette. The applique carries on below the waistline and flows into the skirt in a natural manner demonstrating an expert level of craftsmanship and attention-to-detail. 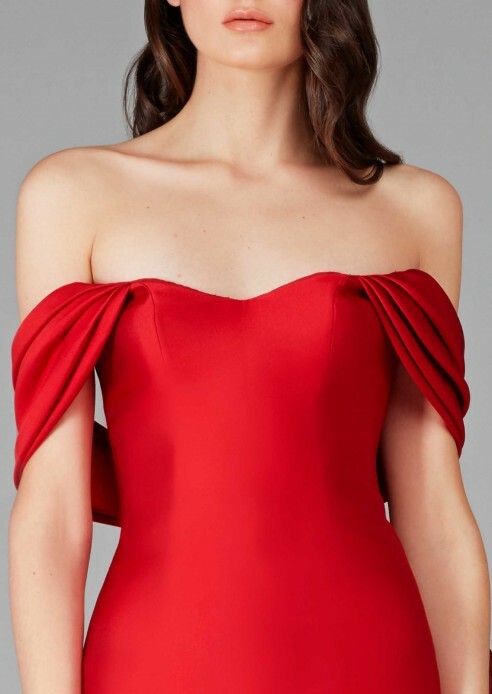 bares an off-shoulder neckline that reveals a pleated sweetheart bust. 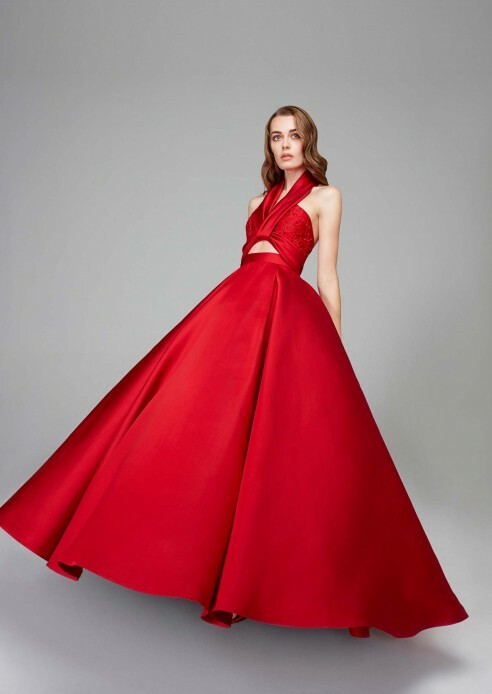 The skirt falls low, with a complimentary dropped waistline that is embellished with more ruffles cascading and wrapping around the body to the back. 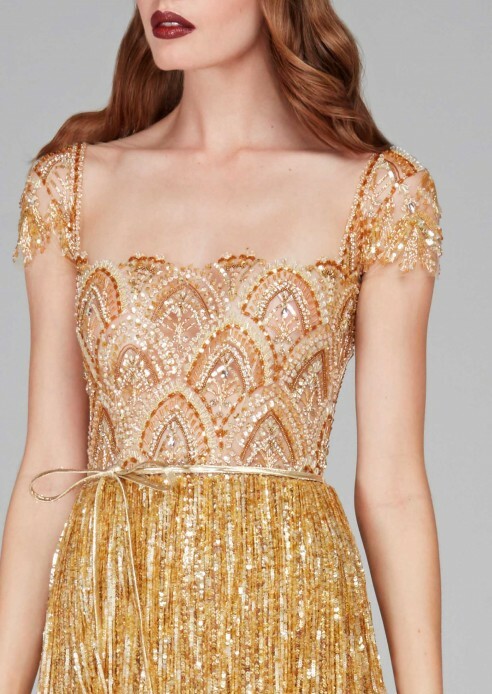 shimmering glass beads, manipulated tulle, tear-drop crystals, and fine embroidery. 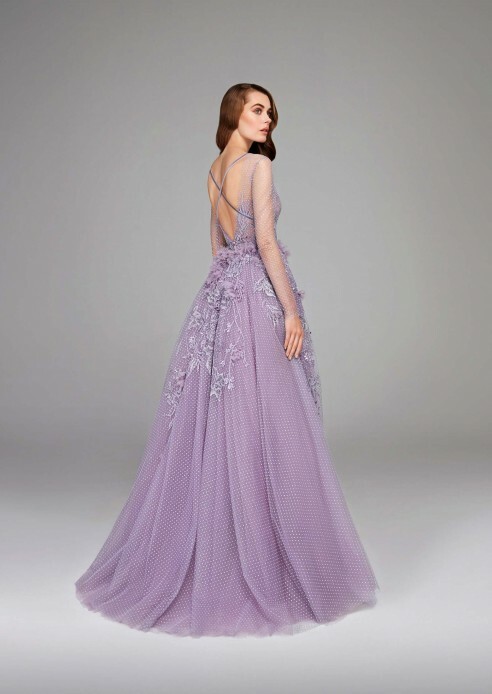 The silhouette falls close to the body with a plunge neckline trimmed with French lavender lace and a cinched waistline defined with a plush velvet belt. Cut in two panels, the underskirt is fitted, while the overskirt wraps around from the back creating even more drama in the front. 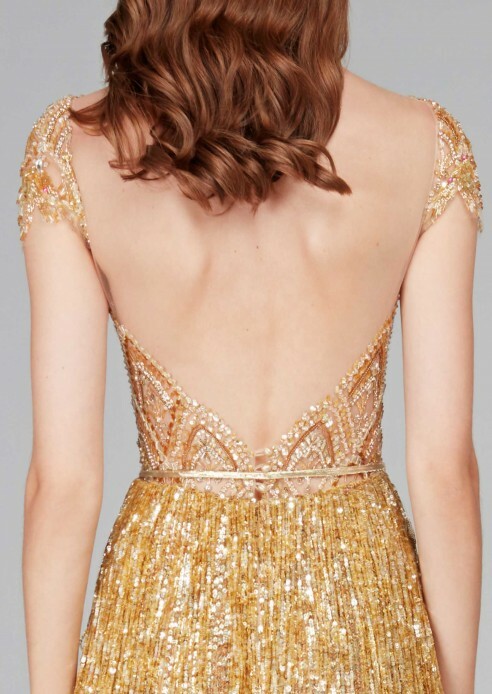 The floor-grazing gown is entirely embellished catching light at every angle... a true showstopper. embellished in a recurring Gatsby-inspired motif using a combination of dainty glass beads, twinkling teardrop beads, gemstones and elegant crystals. The skirt falls to the ankle, in a one-of-a-kind foiled 3D fabric.. A truly exceptional, eccentric piece. 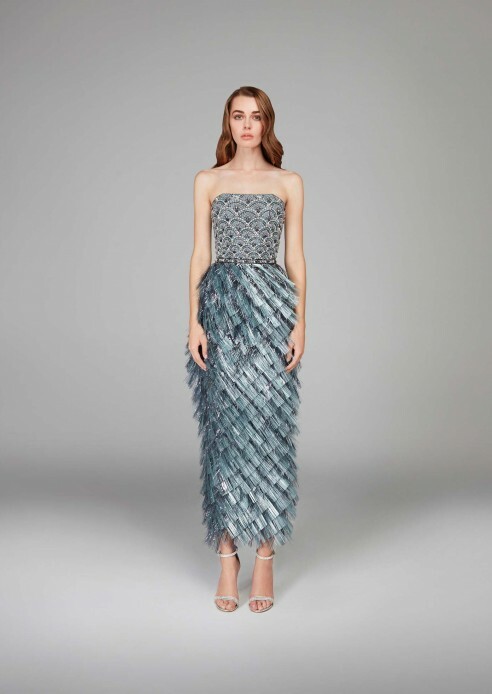 Made from yards of beautiful blue metallic lamé, this gown is all about the silhouette. A strapless and embellished balconette neckline peaks through, contouring the bust beautifully. Little sparkling stars are hand-sewn onto the edges catching light at every angle. Following every curve of the body, the slender silhouette drapes at an angle and cascades from the under-bust all the way down to the ankle with such lightness. ‘Cher’, inspired by the one and only goddess of pop, is a tribute to the groundbreaking artist. 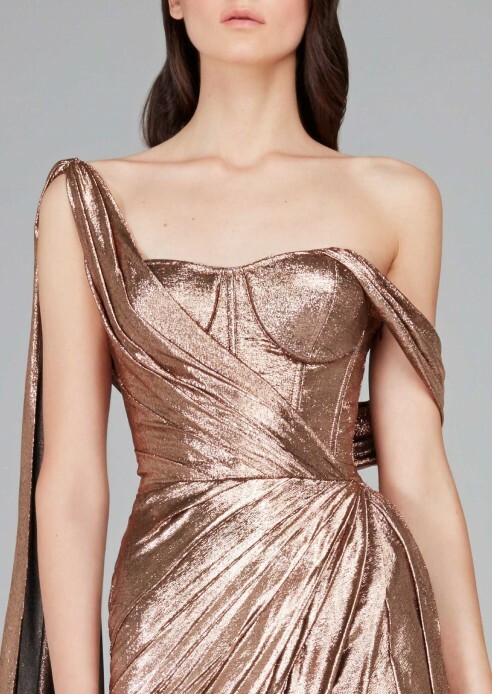 Endless yards of metallic coper lamé are draped and pleated to create a figure hugging silhouette. 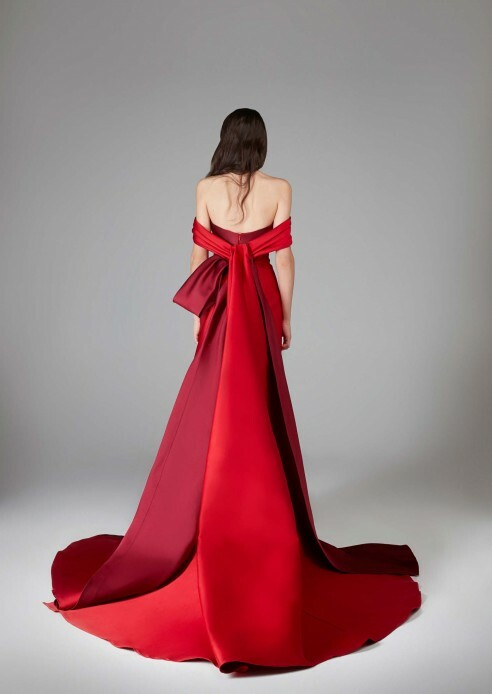 From the waistline, a dramatic drape gathers to the shoulder and falls with such ease creating a train at the back. Featuring a fitted corset and a slit to the thigh, this effervescent design will make a lasting impression. Ruffles, ruffles and more ruffles.. Combining about 30 yards of tulle, this gown is cut into a figuregrazing silhouette. A boned corset is divided into panels featuring golden piping and inserts of fine French lace. 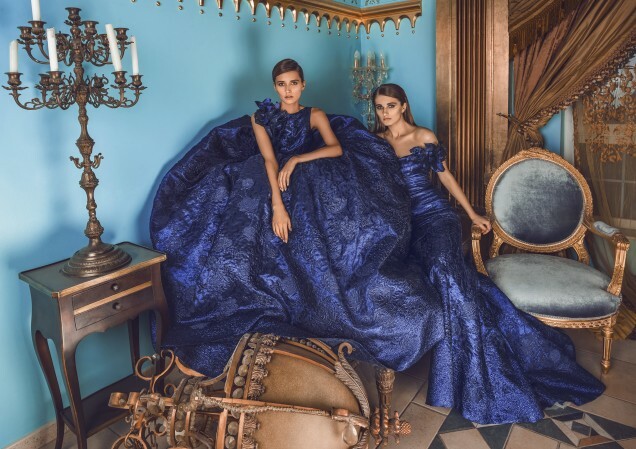 Ruffle accents are used throughout, skimming the arms from the front bodice to the back, and then again with a discreet peplum cascading over the hips. 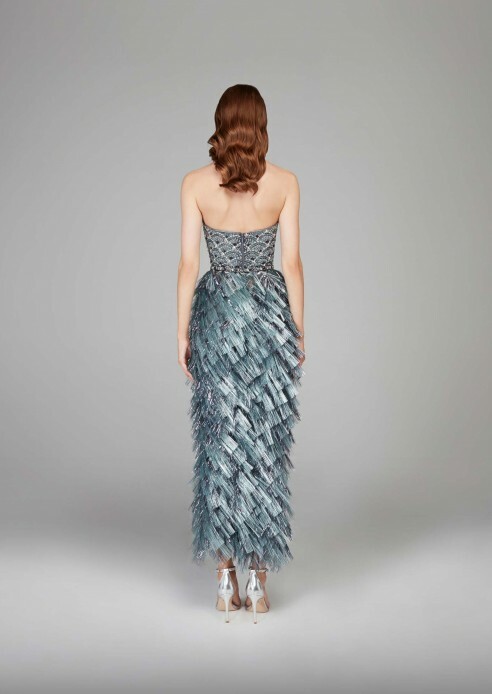 The hemline is the statement here, with over 20 layers of flouncy ruffles creating a flared and flamboyant shape. 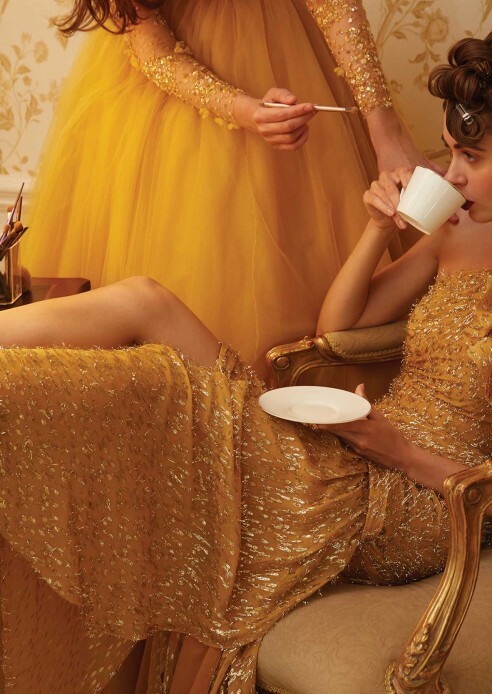 This golden glittered polkadotted number is not for the faint hearted. 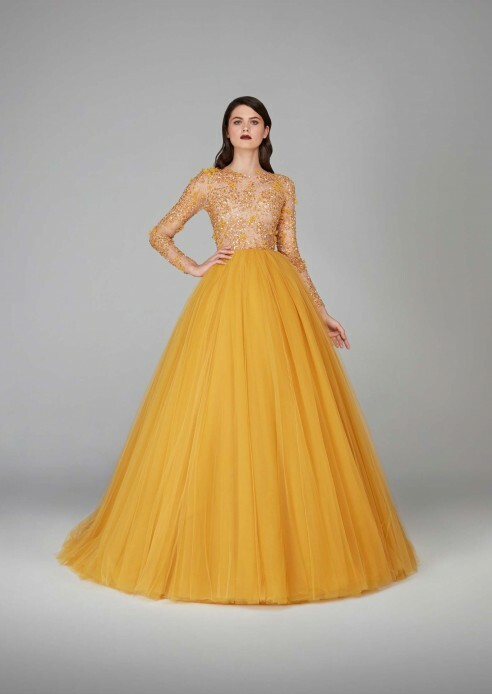 Cut from over 70 yards of fine mustard tulle, this dreamy ball gown is a true showcase of classic femininity. 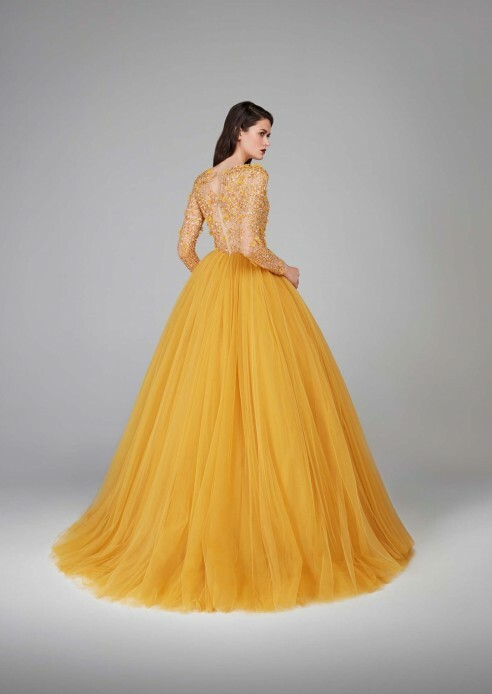 The top, featuring long sleeves, is entirely embellished over a delicate illusion tulle, using an exquisite combination of mustard-colored materials. 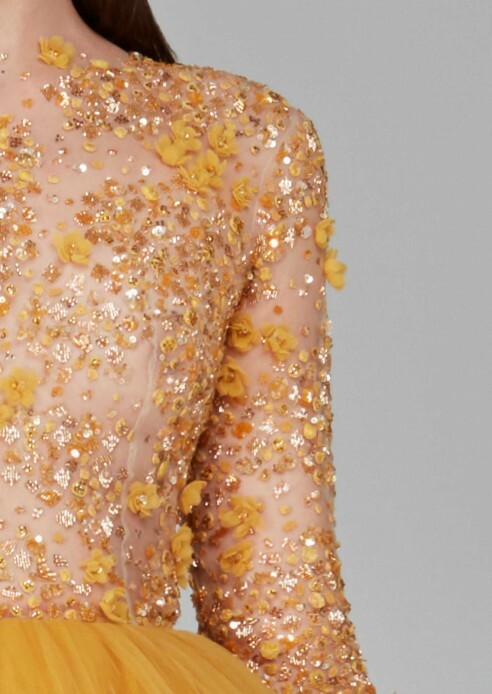 From seed beads to glass beads, sequins to crystals, manipulated tulle to embroidery, the amalgamation of materials in the top have created a honey-comb floral masterpiece. 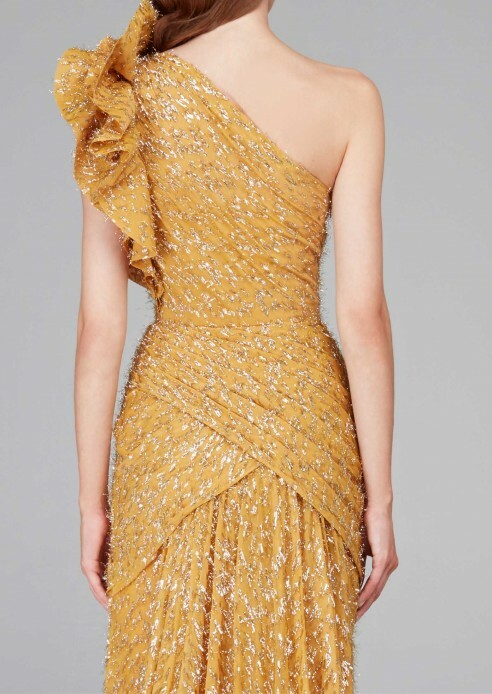 An effervescent composition of silver-textured mustard chiffon, this gown floats against gravity. 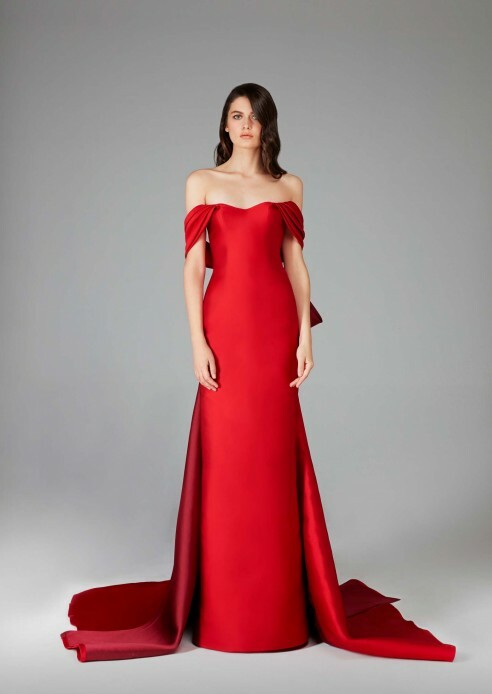 The figure-grazing silhouette, drapes upwards from the waistline to a statement shoulder, where ruffles are gathered to create volume, contouring the neckline beautifully. 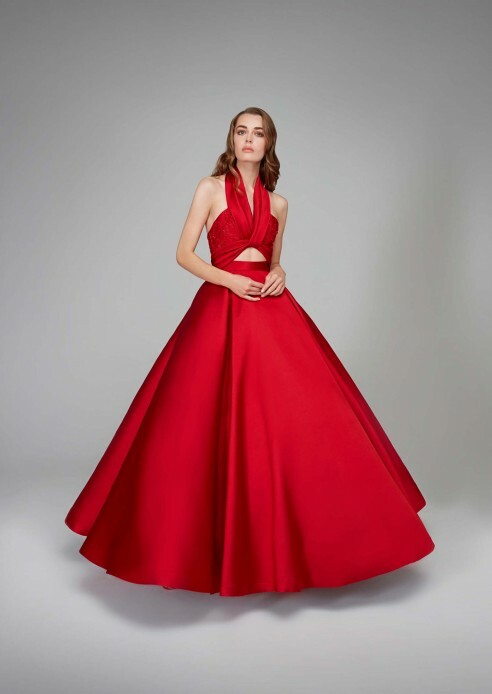 At the waistline to the lower hips, the skirt is pleated across the body, wrapping over itself all around to the back, giving the body a slender and fitted shape. 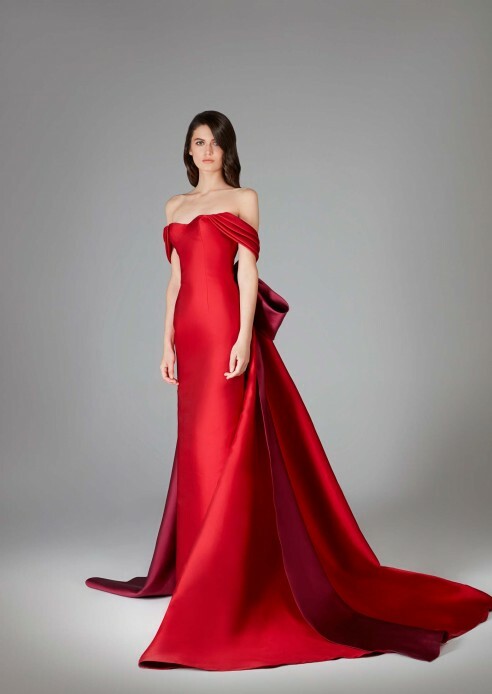 The gown falls naturally to the ground, featuring a slit in the front center, and a train in the back. 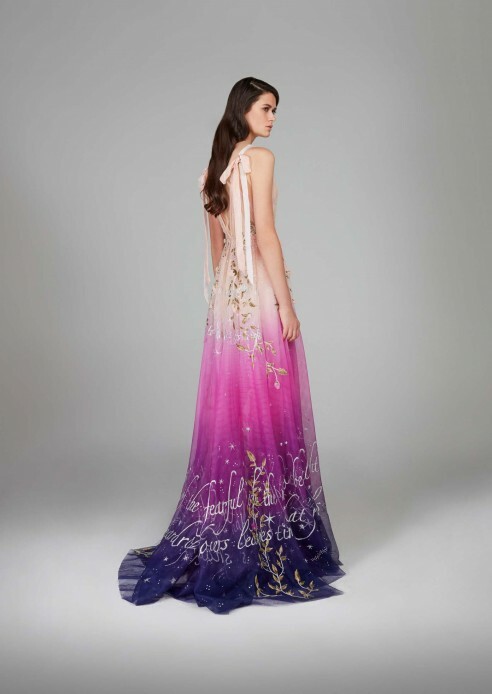 As the name suggests, this gown is a direct translation of the Gatbsy era. 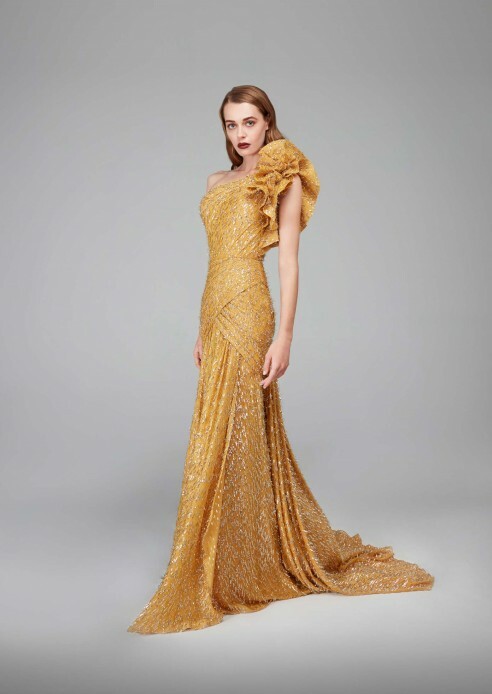 From the decadence to the flamboyance and the over-the-top indulgence, this gown epitomizes luxury, in it’s purest form. Layers and layers of hand-sewn golden tassels are constructed to overlap onto one another in creating a flapper silhouette in the skirt. 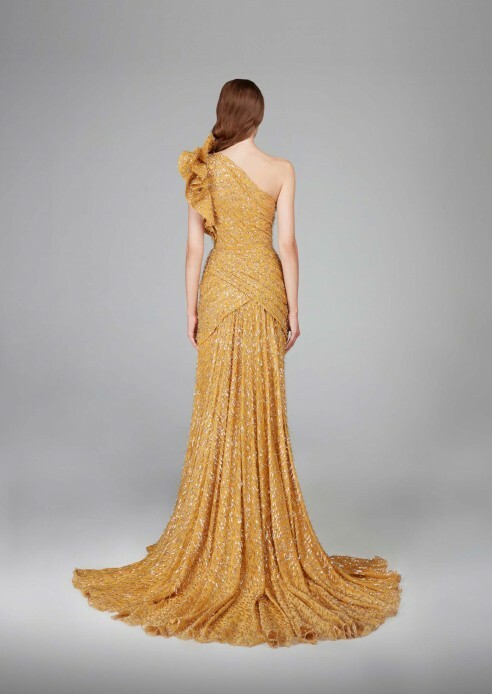 Cut from a fine illusion tulle, the top is fully embellished using all kinds of lush golden materials to create an art-deco pattern. 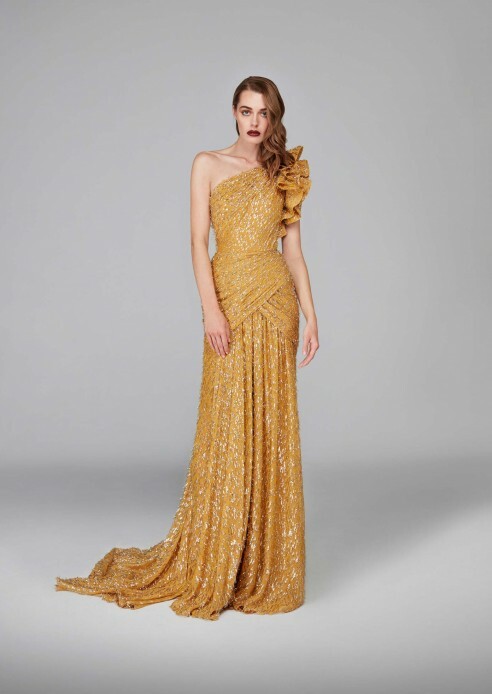 From golden glass beads, to silver sequins, tear-drop crystals and marquise-shaped stones, this gown sparkles with the slightest movement. Inspired by the French icon Brigitte Bardot, this gown is a juxtaposition of modern elements against classic glamour. Featuring long sleeves, the top is cut from a delicate illusion tulle, fitted and fully embellished creating a cool plaid pattern made from glass beads of various color tones and embroidered lines. It cinches at the waistline and follows the body’s natural curves with overlapping blue satin tassels that ripple like water. 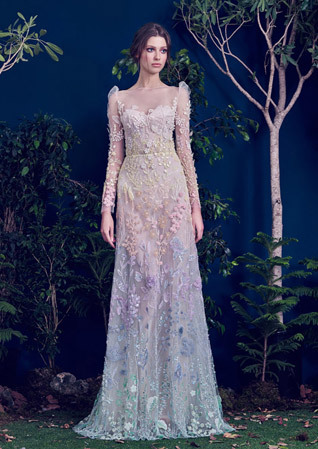 A whimsical and poetic masterpiece, this gown tells a story. Designed in-house, this ombré fabric resembles the transitioning colors of a magical sky at sunset, dusk or dawn. Cut into a deep plunge neckline, the peach tulle is pleated and embellished with beautiful crystals scattered as if to mimic raindrops. The silhouette remains very free-flowing and easy, as the skirt flares out slightly from the waist to the ground. Delicate intricate roses are made from the finest tulles matching the gradients of the gown beautifully. 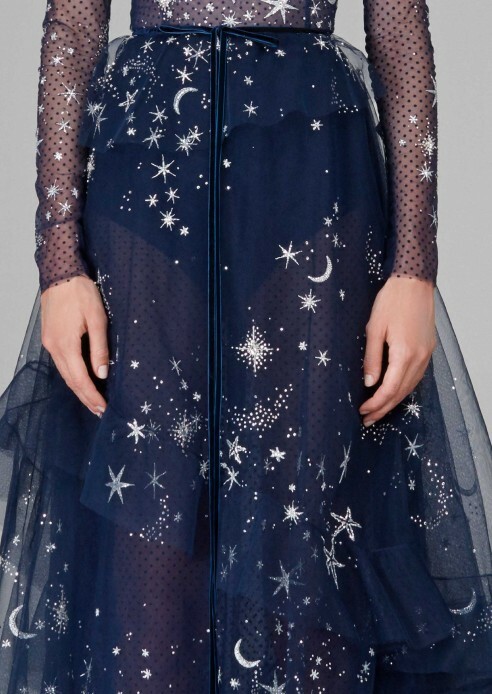 They descend from the waist to meet the sparkling embroidered poem, and they climb upwards from the hemline, through a second poem, to meet and nest within the shimmering moon. A romantic marvel for the dreamers. 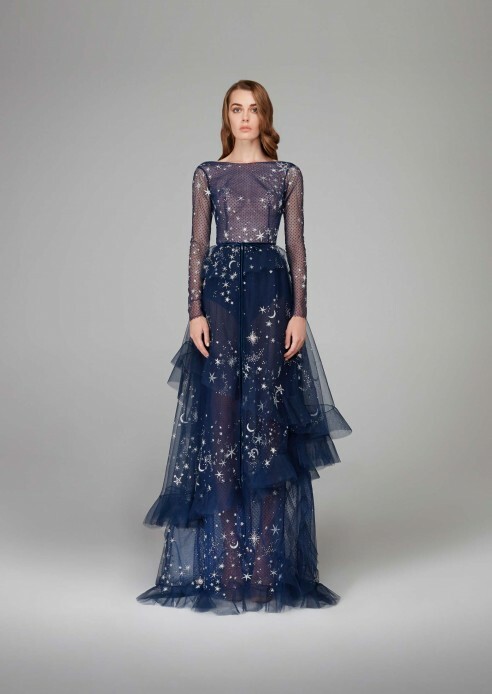 A combination of deep dark blue tulles are layered to create a backdrop that mimics the nighttime sky. The body is fitted and defined featuring delicate long sleeves. A deep blue velvet belt wraps around the waist tying into a loose bow and creating a more defined silhouette. 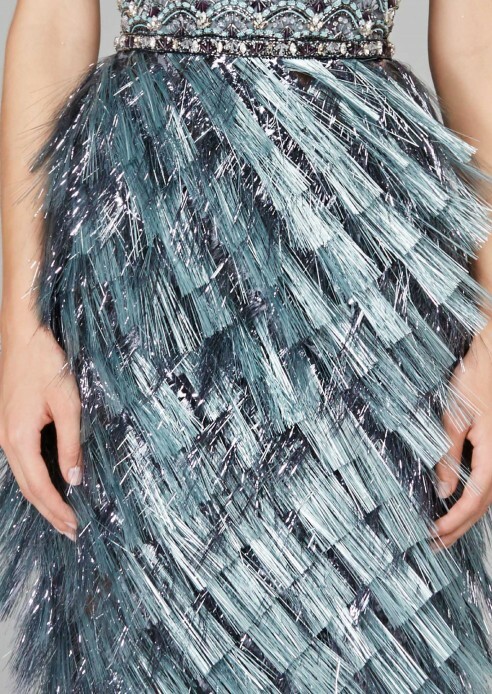 From the waist down, layers of tulle are staggered onto one another following different angles at the hemline. 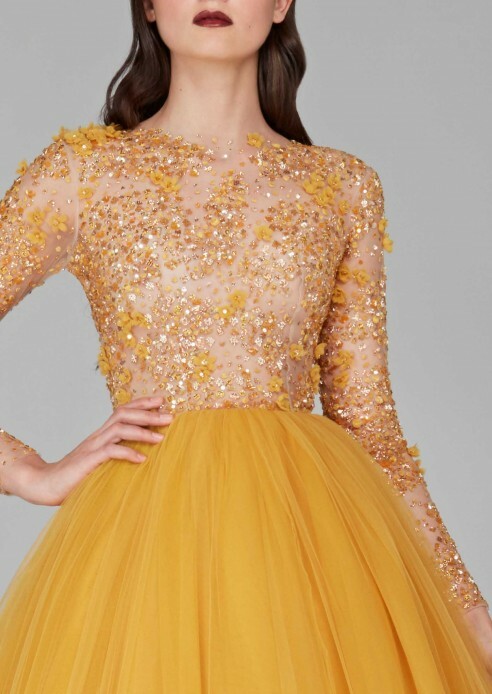 This plays on the soft transparency of the gown, and creates an interesting dynamic in the skirt. 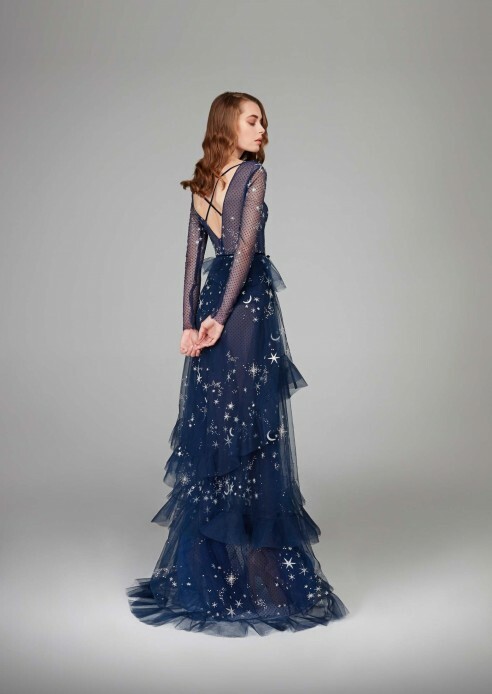 The entire gown shimmers with embroidered little sparkling silver stars, glittering moons, clustered crystals that mimic constellations and shooting stars made from luxurious glass beads and gemstones. 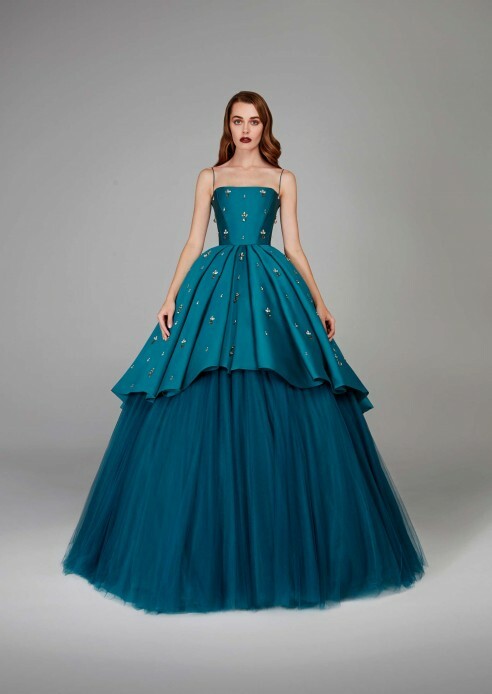 An opulent double sided teal taffeta is used to construct this luxurious ball gown. Cut into a boned and concealed corset, the top is fitted and very structured with a straight and defined neckline suspended onto the shoulders by two neat straps. 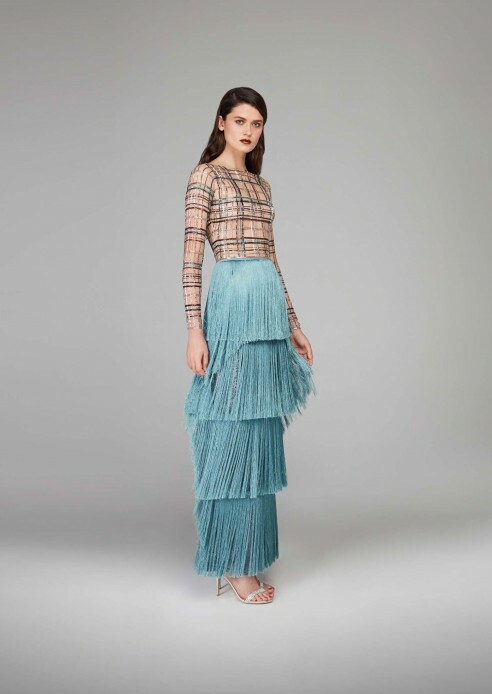 Turning up the volume, the skirt is pleated and flares out with a gradual hemline, descending toward the back and cascading over a dramatic jupon of teal tulle. 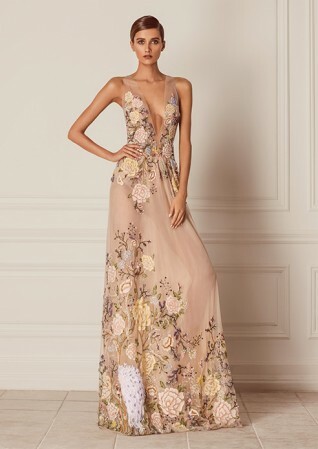 Sparkling tear-drop sapphire crystals and silver gemstones designed into baroque-inspired floral motifs are hand-sewn onto the gown, for that extra glamour. Cut from a luxurious green chiffon, this gown is all about the bombshell silhouette. Pleated from the waist, the fabric creates soft little ruffles revealing trimmed French lace around the sweetheart cleavage. Panels of green lace along the sides create a flattering curve around the body, with an illusion of baring skin. 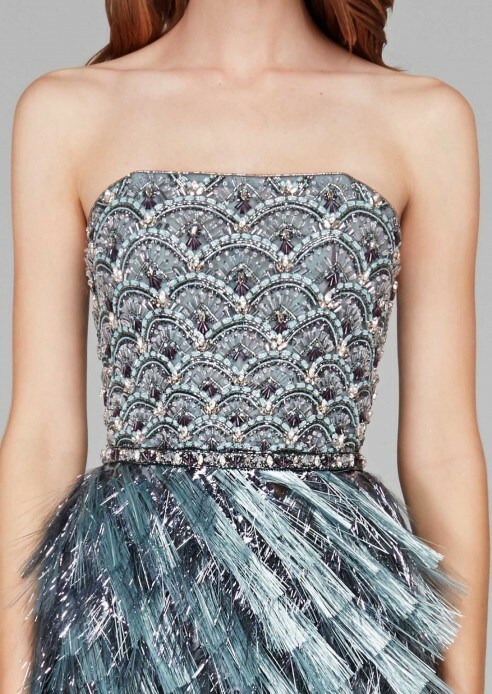 Ruffle details are added along the upper hips as accents. 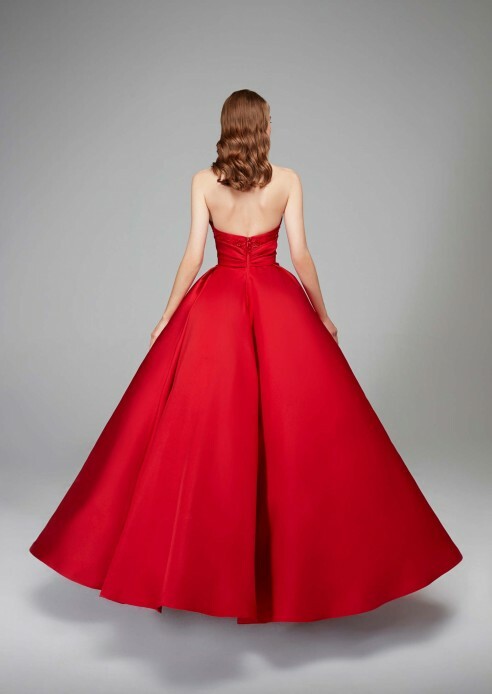 In the front and the back, the pleats continue from the waist down, in a soft, decadent manner, emphasizing the figure in the profile, with a fitted, mermaid silhouette underneath.